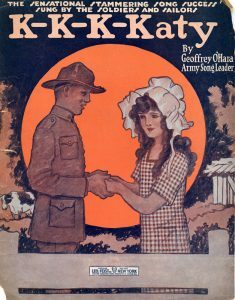 “K-K-K-Katy” was a popular World War I-era song written by Canadian American composer Geoffrey O’Hara in 1917 and published in 1918. The sheet music advertised it as “The Sensational Stammering Song Success Sung by the Soldiers and Sailors”, as well as “The Sensational New Stammering Song” The song was first played at a garden party fund-raiser for the Red Cross in Collins Bay on Lake Ontario. O’Hara was from Chatham, Ontario, and taught music at Ontario University. The lyrics tell of a brave but awkward soldier called Jimmy who is lovesick over the beautiful Katy. He buys a wedding ring before going to fight in France. The inspiration for the “Katy” of the song was Katherine Craig Richardson of Kingston, Ontario. She was a friend of O’Hara’s sister, and her parents recall O’Hara writing the song in their living room. “K-K-K-Katy” was a top 20 song from May 1918 to January 1919 and was number 1 from July to September. It was recorded by Billy Murray on March 8, 1918 and released on Victor 18455. Eugene Buckley also recorded a version of the song. The sheet music was heavily reprinted. The song made a comeback during World War II when songs from World War I became popular at military training camps. “K-K-K-Katy” was one of many songs brought to the front by officers who had heard this song while on leave in England. Older songs such as “K-K-K-Katy” were often preferred over modern songs. The song was covered by Mel Blanc in his Porky Pig voice in 1949, with some vocalists backing him. The song can be heard on the compilation album Mel Blanc: The Man of 1000 Voices 2007. NC 2014 : हकलाहट और भाषा संचार में बाधक नहीं . . .